Bathroom cleaning is something that most people get scared to do. Each and every corner of the bathroom, every bit and piece should be cleaned efficiently as it should be absolutely neat and clean; hygiene is an essential factor when bathroom is concerned. The skilled and experienced professional cleaners are well equipped to tackle bathroom mould through various processes like steam cleaning. 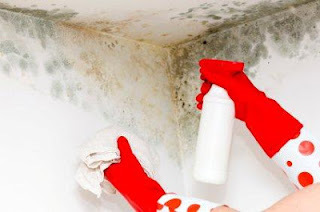 Moreover, they make use of specialist products which not only remove mould but also remove those brown and black stains left behind by the mould. Most of the bathrooms have small spaces and they are always filled with moisture. The cleaning job becomes all the more difficult when air cannot get out of bathroom and mould and mildew starts building up. It is therefore, important to see that the window of the bathroom is left open for some time so that some fresh air comes in and hot air does not get accumulated on the walls and mirrors. Bathroom walls and floors are mostly covered by bathroom tiles and these protect the surfaces from mould and crack by allowing water to run off without getting absorbed in the wall. Tiles of the bathroom require a good clean from time to time to maintain their appearance and condition. For the tiles of your bathroom there is a variety of spray cleaners available in the market. Many love to use their own solution. A popular natural cleaning product is white vinegar. Cleaning and checking should be done every month to prevent major issues. While using a new solution for cleaning your bathroom, make sure to use it on the spare tiles or on a tiny area so that you can avoid any unwanted damage to your tiles. With stronger chemicals there is a possibility of discolouration of the grout. Therefore, first try out on a part of grout in the corner of the room so that no one is going to see if it gets discoloured. To avoid damage of the tiles it is important to follow the instructions carefully. Do not scrub your tiles too hard, scrubbing with abrasive cleaning device can lead to damaging and dulling your tiles. Moreover, if you scrub too hard, then the grout can become loose. By cleaning them gently you can avoid these. Cleaning the bathroom tiles regularly with soapy water is the best way of taking care of your bathroom. A regular cleaning prevents the tiles from serious staining and makes cleaning an easier process. And when there is no hard stain, you don’t have to use harsh chemicals or scrub hard. But in spite of taking maximum care of your bathroom, moulds are sure to come creeping into crevices and corners. Handling bathroom mould is quite a difficult task and most people lose the game someday or the other. This is where professional cleaners come to the picture! The professional cleaning companies offering a variety of cleaning services including bathroom cleaning are the best option for getting your bathroom cleaned in the most professional way. Hiring a professional cleaner you can ensure a satisfactory result. Especially when you have expensive tiles and you want spotless bathroom cleaning without causing any damage, professional bathroom cleaners are the best resort. Author Bio: Sam Duckworth is the owner of a professional cleaning company situated in London. He has written lots of articles and blogs on cleaning services including Bathroom Cleaning Solutions.